Breathslim review: Can you lose weight with Breathslim? Home » Breathslim reviews: Can I lose weight with Breathslim? Breathslim reviews: Can I lose weight with Breathslim? Breathslim is a respiratory device that is promoted for weight loss. For its review, consider this video that features Dr. Artour Rakhimov (the inventor of the Amazing DIY breathing device and author of several bestselling Amazon books on breathing exercises and breathing retraining) who reviews Breathslim (based on testimonials and experience of 100s of his students) and compares it with the Frolov device. Yes, it works for every person who slows down his or her automatic breathing. This requires lifestyle changes related to sleep and physical exercise with nose breathing. As a result of slower breathing, the person has better results for the body oxygen test. Usually most people start with about 10-15 s for the body O2 test, and with over 30 s for O2 in cells, they have nearly no symptoms, great sleep, a lot of energy, and other positive effects of improved health. Are changes in diet necessary? Breathslim generally works without changes in one’s diet, but correction of nutritional deficiencies and other steps (e.g., how to achieve ideal state of the gut) are useful. For a full program of lifestyle changes, visit the NormalBreathing.com site that provides all crucial lifestyle modules related to breathing retraining. If you notices the cover image for the Breathslim video on this page, you will see that I keep Breathslim and the Frolov device in my hands. From the geometrical viewpoint, they are the same devices, but the Frolov device has a tiny container (with 3 small partitions) to add a few drops of essential oils in these partitions. Otherwise, Breathslim can be transparent (i.e., different colors), but otherwise, they are the same. How and where to buy this respiratory device? 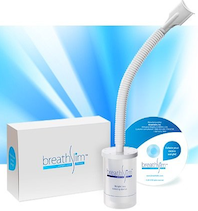 You can buy Breathslim from the main company that manages its promotion in the USA (Breathslim.com). The current price (September 2014) for this device on their site is 50 USD (+US shipping: about 6-10 USD extra). However, if you use this promotion code: NB2012 on the Breathslim website, and you will get your 10% off the retail price. Just paste or remember this promotion code and use it when you submit your Breathslim order. Then it will cost you about 45 USD (+US shipping: about 6-10 USD extra). It is possible to get the Frolov-Breathslim device from Amazon.com. For US and Canadian clients, the current Amazon price is 34 USD (+US shipping: about 6-10 USD extra). This is currently the safest and lowest-price option. Here is the link to BreathSlim and Reviews or click on the image to visit the Amazon page. EBay has several sellers who provide the device. For example, you can get the Breathslim-Frolov device from eBay.com delivered from Russian Federation for 18 USD + 15 USD for shipping (with 3-4 weeks estimated delivery time). So, if there is no rush and you can wait for a month, or you teach breathing retraining for your students, you can get it from Russia (likely with instructions in Russian and without the DVD that explains how to use the device). Keep in mind that Russian sellers generally do not include instructions on foreign languages (Dinamika from Novosibirsk provide instructions and DVDs on other languages for the export version of the Frolov device, but not for the Russian one). Hence, you can consider getting the book “How to Use Frolov Breathing Device” (see details below). This book includes instructions in English from Russian producers (in the appendix). Generally, other options are either more expensive, or with long delivery, or from less known sources. For example, you can buy it for 40 USD + free shipping worldwide from http://0911.biz/. It is from unknown people (no info on their site – http://0911.biz/about-us.php) likely located in Russia, and likely takes the same 3-4 weeks. There are many online health shops who offer Breathslim-Frolov devices for 80 USD and higher prices. Both the international version of the Frolov device and Breathslim producers provide instructions for use (a booklet and DVD) in English and other languages. Breathslim instructions are too simple, and insufficient for people with severe respiratory problems, very low levels of physical activity, hypertension, panic attacks, pregnancy, and so forth. Dinamika instructions are excellent for people with very low body O2 content (less than 15 s). More (or probably most) detailed instructions for Breathslim (and Frolov) can be found in the book “How to Use Frolov Breathing Device (Instructions)”. This book explains all contraindications, the body oxygen test (the CP test), how to create a program for breathing retraining, main lifestyle changes, how to make the modified Frolov device (for advanced users), and how to make a transition to more advanced Buteyko breathing exercises.